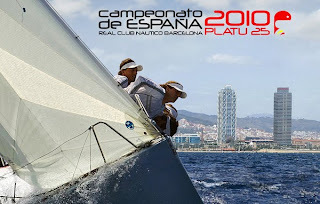 The Spanish and International fleet will gather in Barcelona in the last weekend of June to pass the first main preliminary test before the Alicante World Championship 2010. The Club Náutico of Barcelona is one of the oldest sailing clubs in Spain. A quick look at its trophy section brings a deep feeling of classic yachting and high level competition. World and Olympic Champions, Counts, Kings, Princes, and many top-level, world-class sailors have raced under its colors. This is the magnificent venue that the Platu 25 Class of Spain has chosen to kick off one of the most competitive seasons of its short history. The Spanish Platu Class has designed a summer calendar that intends to be irresistibly attractive for the international teams on their way to Alicante. Our aim is to bring in as many boats as possible to create a sort of Mediterranean Circuit (first, Barcelona, then Valencia –Reina Trophy- and finally, Alicante) that will be easily accounted as one of the most competitive and tied racing series of the world in 2010. If you want to measure your skills against the best one design fleet in the World, you can’t miss our Platu 25 races this summer. Transfers from Barcelona to Valencia and again to Alicante will be offered to the international contenders coming to all the three events.